About George A. Amedore, Jr.
George A. Amedore, Jr. was first elected to the New York State Senate on November 4, 2014. He represents the 46th District, which consists of all of Montgomery and Greene Counties, and portions of Schenectady, Albany, and Ulster Counties. 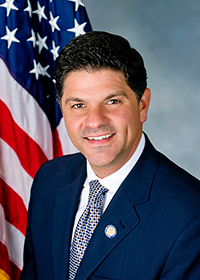 Senator Amedore serves as Chairman of the Senate Standing Committee on Alcoholism and Substance Abuse, and as co-Chair of the bipartisan Joint Senate Task Force on Heroin and Opioid Addiction. Senator Amedore is a member of the following Senate Standing Committees: Banks; Consumer Protection; Corporations, Authorities and Commissions; Elections; Judiciary; Social Services; and Veterans, Homeland Security, and Military Affairs. He also co-Chairs the Senate Task Force on Workforce Development and is a member of the Senate Task Force on Lyme and Tick-borne Diseases. Prior to being elected to the Senate, he served as the Assemblyman for the 105th Assembly District, covering Montgomery and Schenectady Counties. He was first elected in a special election on July 31, 2007; and was re-elected in 2008 and 2010. The oldest of five boys, George Amedore was born and raised in Schenectady County. He serves as Vice-President of Amedore Homes, a second-generation, family-owned business that has built homes for thousands of families throughout the Capital Region and has created hundreds of jobs. He brings his experience as a small business man to his role as a Senator, championing lower taxes and reducing regulations on New York businesses to encourage them to grow and improve the states’ economic climate. The Amedore family has been involved in many charitable endeavors throughout the Capital Region, including rebuilding the family room at Albany’s Ronald McDonald House, the construction of a new hospice facility, the remodeling of Camp Amedore -- an Adirondack-style family space at the Bernard & Millie Duker Children's Hospital at Albany Medical Center – and the construction of a local memorial to honor our veterans. In 2011, George Amedore was active in connecting state and local resources to families and communities that were impacted by the devastating floods that followed Tropical Storms Irene and Lee. He continues to be involved with the recovery and rebuilding effort throughout the region and is committed to seeing a complete revitalization in the affected communities. Senator Amedore resides in Rotterdam with Joelle, his wife of 25 years, and their three children: George, Anthony and Bria.